Warning: not for the faint-hearted. We all know Africa can be dangerous. Beautiful, tick. Exciting, exotic, awe-inspiring – tick, tick, tick. And really, really dangerous. More people are killed each year not by lions – but by the hippopotamus! You don’t dare go to Africa without a phalanx of pills, dressings and preventatives just to ward off the more ordinary threats like Malaria and tropical ulcers. All of which I took abundance (and a good thing too, as it turned out). But I wasn’t quite prepared for things much, much smaller than a cute, albeit deadly hippo. I need to get two things straight up front. One: I’m not arachnophobic. I don’t exactly like spiders, but I don’t go shrieking off into the night when I see a little thing in the corner. (Hey, I’m from Australia – what can I say?) Two: I’m no shrinking violet when it comes to travel. My trip had already taken me solo through the middle east and the northern half of Africa by the time I reached Zambia, so the native fauna was something I’d already grown accustomed to. The sights and sounds of the African continent are truly something to behold: a rich conglomeration of animals, birds, people, landscape, culture and an ancient essence of magic and life that’s really quite addictive. 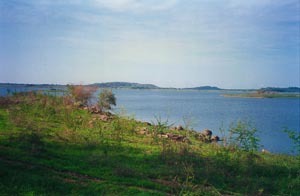 Zambia itself is a compelling clash of desert, bush and jungle, and the people warm, friendly and always ready for a laugh. But this one night, well, this was a little different. 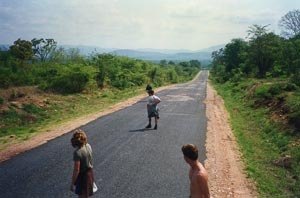 I was travelling through central and southern Africa as part of a group tour, on the back of a Bedford truck. We set up camp at night, took turns cooking for the group and occasionally got to sleep on the back of the open truck where the seat cushions were far more amenable than the hard Zambian ground. We’d had to make a stop at a clinic earlier in the day so we were about four hours behind our itinerary and nowhere near our scheduled camp ground by the time it started to get dark. In the African bush, sunset brings a molasses-thick darkness and the sudden awakening of a whole host of unseen nocturnal creatures that may well be hidden for good reasons. In short – we needed to stop while we had enough light to make camp. Our driver and guide found a place in the middle of nowhere, a ranch with a nice lake to one side where they allowed the occasional bit of camping. We were told the safest area to pitch and to not go too close to the water as there were crocodiles. 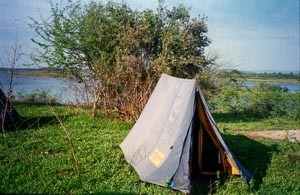 With the efficiency of people who have been on the road for more than a month in Africa, we each got our tents up on a nice raised spot about 100 meters from the water – clear of the crocs and any other wandering thing with sharp teeth and a large appetite. The cooking group set about lighting a fire and chopping up vegetables while the rest of us pulled out chairs and sat around the campfire. As the sun disappeared beyond the lake, the usual chatter mingled with the clattering of pots, creating a soothing, domestic atmosphere. With a beer in my hand, I got as comfortable as I could get on my wooden stool. Laughter rippled across the group as we tried to identify what the disembodied voice was referring to. Then some smart person pulled out a torch and pointed it downwards at the darker areas beyond the firelight. Beneath our chairs. A spider the size of a human hand. Heavy, mean-looking, and just a little bit hairy. But it wasn’t just one – there were hundreds, all around our sandaled feet. The moment the light hit them, they began scampering in every direction. I’ve never seen so many people move so quickly. Somebody screamed. I jumped up onto my chair – completely forgetting that the spiders could climb way better than me. Frantic scrambling filled the campsite as the darkness was pierced with swords of torchlight flashing in every direction like a WWII sky hyped up on cocaine. For about two minutes – which lasted about an hour – nobody moved. Then somebody adventurous (not me) who was still wearing their hiking boots stepped onto the ground. A breathless pause – then we dashed for our tents, violently zipping ourselves inside in the hope that thin nylon and a little netting would protect us from the barely-seen but enormously-imagined horrors outside. I’m not sure anybody slept that night. I know I didn’t. In the bright light of the next morning, there was no sign of the spiders. At a nearby town, we were told that the spiders are common in Africa, known as the deadly Brown Widow! Subsequent research however, makes me think it was more likely the Camel Spider – not an actual spider at all, and completely harmless. And no, that doesn’t make me feel any better – or like spiders more. Of course, you know I’ve told this story whenever I have a captive audience. I did it again on my last camping trip. And then wished I hadn’t. It was as dark a night as the Australian bush can provide, littered with sparkling stars, but no moon, in a gorgeous spot overlooking the Mitchell River – and 40km of truly awful 4WD road away from any signs of civilization. 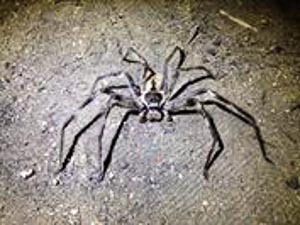 Surrounded by friends, their wide-eyed kids, about 36 possums and who knows how many scurrying, cheeping birds in an otherwise-silent night, I spun my tale of giant arachnids, hairy legs (the spider’s, not mine) and how lucky we’d been to survive. A few appreciative noises were to be heard from the group, with perhaps a shiver of apprehension from a couple of the kids. Suddenly, I had the vague feeling that something was moving around my sandaled feet. I grabbed my torch, positive it was just my imagination triggered by my own story. The light flashed on and there, a mere centimeter from my left foot was a tree huntsman wider than the span of my hand. Chairs crashed back, torches flicked on, children squealed in either excitement or horror – I couldn’t really tell which as I was scrambling to keep my exposed feet safe. Amongst us all, only the spider appeared unconcerned. Oblivious to our petty concerns, she meandered on her way, heading slowly – and may I say, rather beautifully – towards the nearest trees and disappeared into the night. Note to self: don’t wear sandals around a campfire at night – and stop telling the damned spider story. You never know what it might conjure up. When has an unexpected spider interrupted your day?